The Corporate and Commercial team at Essex-based Law firm Thompson Smith and Puxon (TSP) has been rated as Top Tier in Essex in the 2017 Legal 500 rankings, one of only 2 firms in Essex and the only firm in Colchester to be given this top recommendation in this practice area. Team leader Mary Anne Fedeyko who, according to the Legal 500, is ‘incisive, cool-under-fire’, and has a ‘sharp intellect and always delivers’, is singled out as a Leading Individual in its guide to outstanding lawyers nationwide. Colleagues in this ‘first-rate’ team, Nick Mayles, Claire Powell and Caroline Nicholls, are also recommended, and Caroline is singled out as a Next Generation Lawyer. Mary Anne and Richard, along with Team Leader Stephen Firmin, are also recommended for their Agriculture and Estates work, a new recommendation for TSP in 2017. Senior Partner, Mary Anne comments that ‘growing our agribusiness practice has been a key goal for the firm, and so we are delighted to be recognised for our work in this area’. Stephen, who also leads ‘an excellent team of top-flight lawyers providing proactive advice’ on Commercial Property matters, is a fellow of the Agricultural Law Association, and has ‘extensive expertise in all land-based transactions’. Agriculture and Commercial Property colleague Kerry Addison is ‘recommended for her excellent ability to structure development deals and her holistic advice; she is very practical, realistic as well as tenacious and patient in negotiations’ and highlighted as a Next Generation Lawyer. The firm also achieved recommendations for its Dispute Resolution – Commercial Litigation team, led by Sharon Auton and including the ‘thorough and pleasant to work with’ Judith Winward. For private clients TSP’s Clinical Negligence team is recommended as being amongst the best in the South East of England and is rated as one of the top two firms in Essex. Recommended for its ‘commitment, personal service and relationships with clients’, the lawyers in the team are praised for being ‘insightful, prompt, responsive, clear and highly organised’. 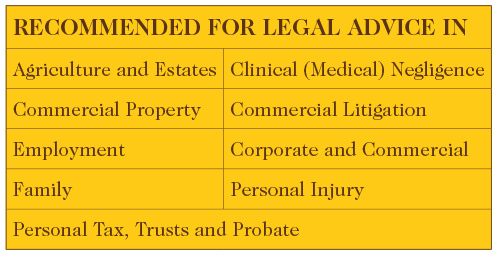 Cases handled by the team span neonatal, psychiatric and orthopaedic claims involving both children and adults. Colchester-based Julian Wilson leads the practice and focuses on birth injuries and cerebral palsy cases, while Steve Webb, whose ‘strength is his ability to explain difficult legal issues in simple terms’, undertakes brain injury work. 21 of the firm’s lawyers are recommended by the Legal 500 and 4 have been singled out as Next Generation Lawyers.